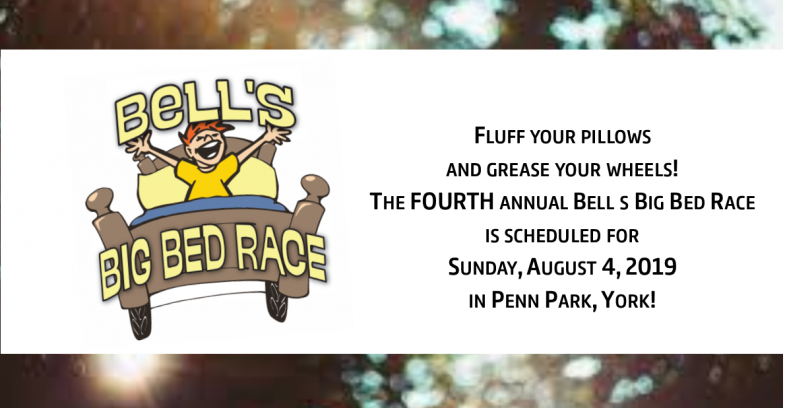 Bell’s Big Bed Race is a quirky, super fun, family-friendly event to benefit Bell Socialization Services’ programs that help make sure local people have safe, affordable housing and a bed to sleep in at night. Event day kicks off with a Parade of Beds where you can check out all the great decorations and pick your favorites. Awards are presented for People’s Choice and Judge’s Choice.
! NEW VENUE THIS YEAR ! The 2019 Bed Race will be held at Penn Park in York in coordination with Equality Fest happening the same day from 12 noon to 6 p.m. For directions to the event site from where you live, use 100 West College Avenue, York as the address. Event PARKING – There is free street parking plus some local lots. We’ll update details as we get closer to the event date and there will be signage on event day to direct you. GUIDELINES, RULES, & REGULATIONS Click to get the official scoop on building your team and your bed. READY TO ROLL? — Registration is NOW OPEN. Get your business or organization in front of lots of good people and show that you share our vision of a community where people are valued and respected, and live with dignity. Get details on Sponsor info here. Stay connected to OUR FACEBOOK PAGE for updates. 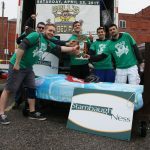 Search #BellBedRace2019 to see pix and comments on Facebook, Twitter, and Instagram.